An unknown BlackBerry handset appeared in the benchmark database powered by Samsung's notorious chip, but none of the two companies said anything about it yet. 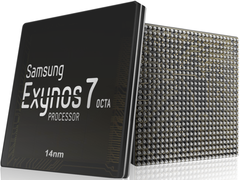 Right now, the Samsung-made Exynos 7420 SoC is one of the best mobile chipsets on the market and, for a while, it was only used by Samsung in its own premium devices. Meizu recently launched the Pro 5 smartphone as the first non-Samsung device to be powered by the Exynos 7420. Now, a GFXBench database entry reveals that BlackBerry is testing a handset that uses the same chipset. BlackBerry STV100-1 is apparently a 5.1-inch smartphone currently under development/testing that uses Samsung's 64-bit octa-core Exynos 7420 clocked at 2.1 GHz. The GFXBench database entry also reveals that this device has a generous QHD resolution, 3 GB RAM and 32 GB internal storage, a 5 MP front camera, and a 16 MP main photo snapper. Although most premium Android handsets launch with Android 6.0 Marshmallow these days, the STV100-1 seems to run Android 5.1.1 Lollipop. The Exynos 7420-powered BlackBerry handset has a full range of connectivity options and sensors, including GPS, NFC, pedometer, WiFi, Bluetooth, proximity and light sensors. All these should be taken with a grain of salt for now, but we will get back to BlackBerry's upcoming handsets as soon as we hear more about them. If the above proves to be more than just a rumor, the STV100-1 might be the second Android handset by BlackBerry we already talked about.